New kit for next season. I have no idea what it will be like but this first non-rubbish Newcastle one for ages would be nice. Re: New kit for next season. Why is there a random old man In the photo? I'm sure we will have another Errea kit the problem is we have already used the straight out of the catalogue striped number. I just scrolled across and saw Beardsley I have my screen zoomed in. It all makes sense now for a moment I thought Mike Ashley was being tight with his budget again. 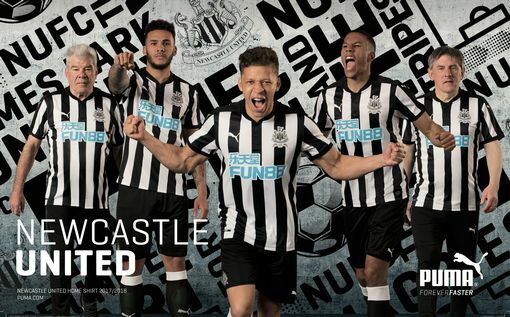 Good to see the players wearing a traditional design for their fleeting return to the Premiership and I suppose a Chinese betting firm is a slight improvement on Wonga as shirt sponsor. Why do these shirt manufacturers only produce short sleeved shirts? Are they short of material? Silly question, Benny - imagine the complaints from the players if we couldn't admire their tattoos! Nice, but maybe too much black on the back? A few seasons ago they had to stitch ugly white squares on the back due to the refs only wearing black at our level!